DESCRIPTION: When a particular topic has been covered by a great many very good books, a reviewer tends to start on a new book by considering why it is necessary. Of course, printed-paper books do go out of print and publishers go out of business, so some excellent books simply become unavailable except in the recesses of a second hand bookshop. There is also the march of technical development that requires a new author to revisit a group of topics and write an up to date book on the subjects. This book from Haynes is immediately recommended because of the reputation the publisher has established for well-illustrated practical manuals. 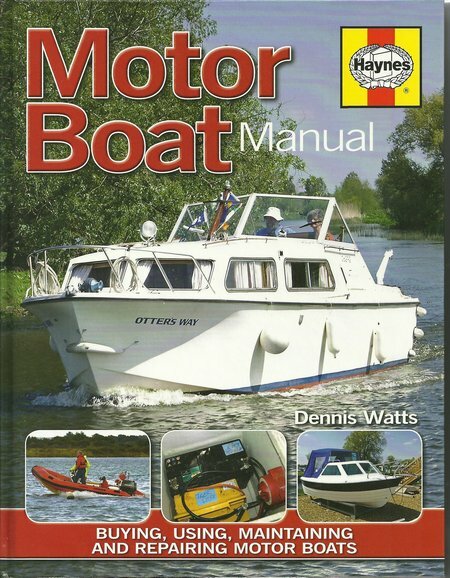 The author is aided by the fact that the best motor boat manual yet written has been out of print for decades and because of its age the surviving copies do not cover recent developments in motor boating, particularly in the development of marine electronics and GPS navigation. As a new book, the subject is up to date and likely to remain reasonably current for several years, at the end of which time, Haynes will undoubtedly consider a major revision. Boating is an interesting area of technology because many of the aspects covered in this manual will probably not change for decades, although other aspects, particularly electronics, will change very rapidly. The author has provided a comprehensive, logical, and understandable practical review of all of the aspects of acquiring, owning, maintaining and operating motor boats. The Introduction makes a promising start by pointing out that it is possible to get afloat without spending a fortune. Motor boating will never be a cheap hobby, but the very wide range of types and sizes of motor boats, and the availability of used craft, provides good entry level options for those starting into the activity. Two potentially expensive aspects of motor boating are mooring and boat yards. Acquiring a boat that can be taken out of the water and towed home at the end of the season can save a great deal of money. Having brought the craft home, it can be worked on to prepare it for the next season, and when the time comes to use it again, it can be moved by road to a number of locations much faster than it can sail between locations, providing maximum time in a specific environment to enjoy sailing those waters. Having looked at some of the basic options, the manual moves on to describe the parts of a motor boat covering the main types of inflatable and rigid hulls with outboard and inboard engine choices. Having covered these essential differences, the next chapter considers the choice of boat, providing some sound advice and covering the important considerations. The next two chapters cover respectively the buying of a second hand boat and a new boat. The advice is adequate as a framework of considerations, what to look for and what to avoid. However, this is guidance rather than the firm instruction of a technical manual. The novice is always advised to seek assistance from relatives or friends who have an established experience of motor boating, simply because it is a potentially complex subject with a number of pitfalls that are best avoided on the basis of hard experience. The next two chapters cover the very important subjects of running costs, mooring, storage and transport. A surprisingly large number of novice boat owners pay inadequate attention to these aspects of boating, concentrating on technical and operational aspects, only to find out that the boat they have acquired is eating up more of their finances than they can really afford. At chapter 8, the author provides an introduction to motor boating. Subsequent chapters deal logically with the technology of hull, engines, and accessories, including the vital safety equipment. The text is very well supported by colour photographs and drawings. The final chapter considers the future and this is important but often neglected by boating manuals. Boating in any form is usually addictive. From the first boat, the boater is likely to pass through a number of craft, larger or smaller, reflecting his or her developing knowledge and ambition, modified by all the other calls on finance and time through the stages of life. The manual concludes with an Appendix that provides a selection of valuable contacts and information, including a glossary of terms. This all adds up into a very useful manual covering an absorbing activity that is proving increasingly popular. It is a good starting point, but it will also be a useful reference for any sailor as skills and ambitions develop. Readers may be advised to also purchase a copy of the Sailing Boat Manual by the same author from the same publisher. Whether a sailor starts with sail or power, he or she may move from one area of boating to another several times through life.